So we had an amazing go on Kickstarter raising nearly double the funds we requested in the spring. For rewards we chose to give people everything from bendir frame drums to prints from John Francis Peters. But we also gave people cds- 3 packs and 6 packs depending on their funding level- and now have to pack and ship nearly 500 cds to about 150 donors. Today we are in the living room opening jewel cases and making our own bootleg packaging. 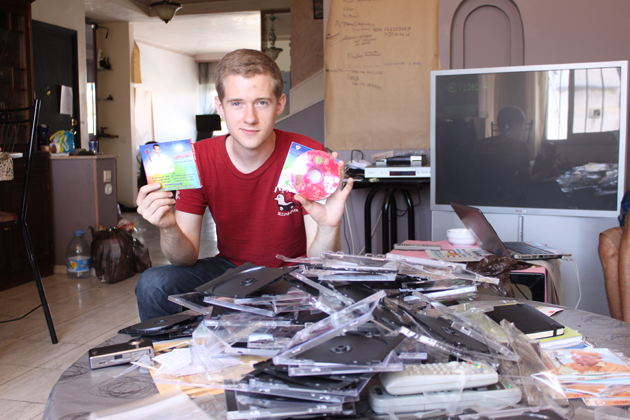 Mail is expensive in Morocco – so if we wanted to include any non-pirate material we had to repackage everything- but I’m still not sure what we’ll do with all these jewel cases. Carolyn and John are in Kenitra following around Adil Miloudi . Jace is writing his postcards. Bo just left for Florence to do a quick show to up our coffers. Juan is editing + slicing string beans. Maggie is writing. And I’m just steady blogin.